Thanks to Greg from Reigo & Bauer Architects for sending us photos of this house. 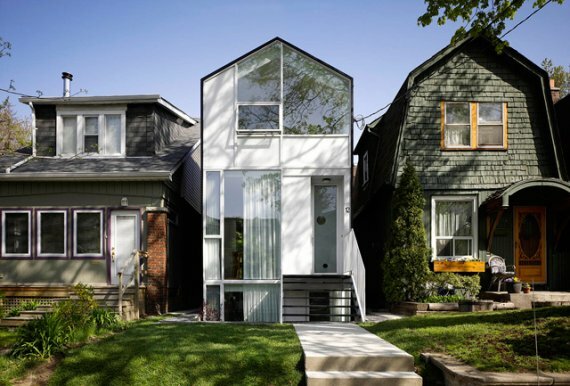 Located in Toronto Ontario, this house was designed and built to sell. 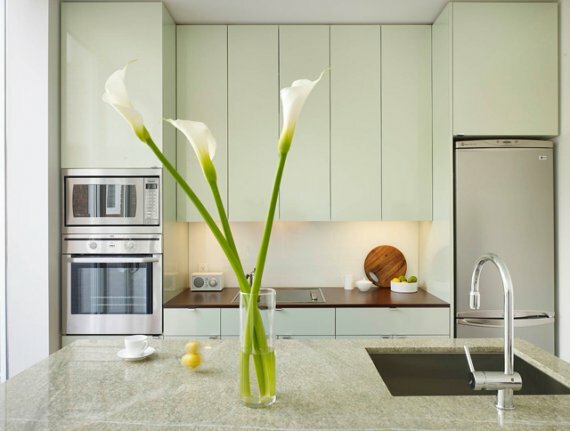 As both designer and developer of this project, Reigo & Bauer believe architecturally designed houses should be available to the average homebuyer. 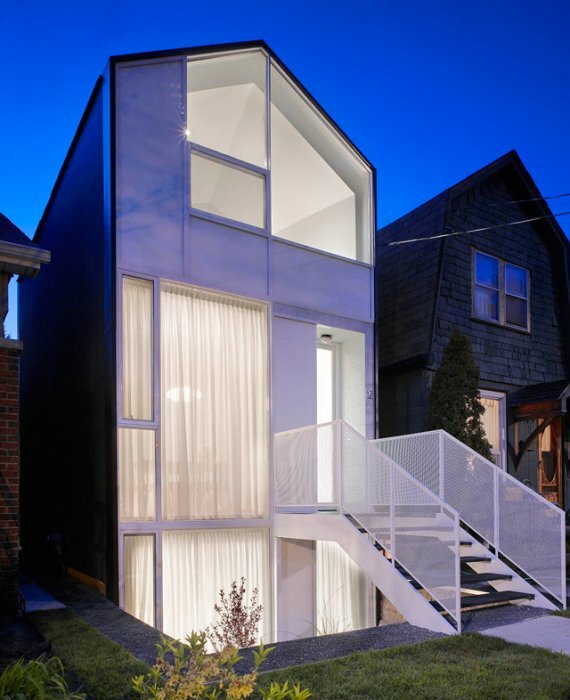 The objective was to offer Toronto homebuyers a newly constructed house with a contemporary design at a competitive price. While this house is comparable to a standard condo in size and cost, it differs in that it has a front yard and back yard, three finished floors of living space and natural light from the front, back and roof. The property was offered at $419,900 CAD and sold for $414,000 CAD in October 2006. Visit the Reigo & Bauer website – here. 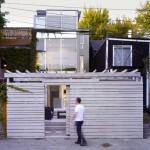 The design for this small two-bedroom house fits into the neighbourhood while still being contemporary. With an exciting and approachable design the house relates to the tightly packed cottages with peaked roofs without replicating them. The roof is symmetrically pitched at the front and sloped to one side at the back, which gives each of the rooms upstairs a different spatial quality. Although the form of the roof is complex, it has been built using standard wood frame assembly, adding architectural intrigue without adding to the cost of construction. 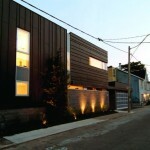 Because this house was built on spec, keeping the costs down was a primary focus. 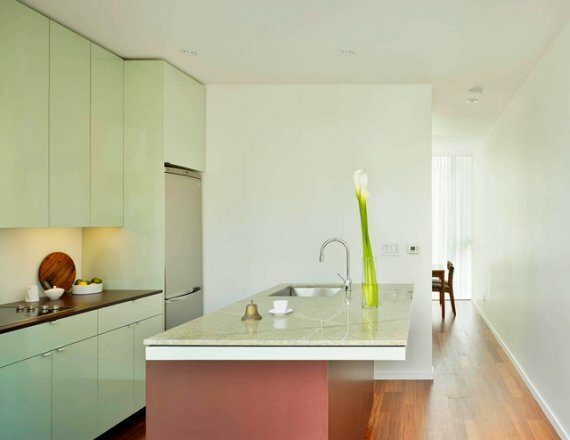 In order to afford features like the glazed walls, hydronic in-floor heating, and a heat recovery ventilation system, standard finishes and typical installation methods were favoured over costly finishes and complicated detailing. In contrast to the solid walls on both sides of the house, the front and back faces are entirely glass. The glass was rendered opaque only where necessary to conceal structural panels, in order to maximize natural light and give the modest interior spaces the impression of being larger than they are. 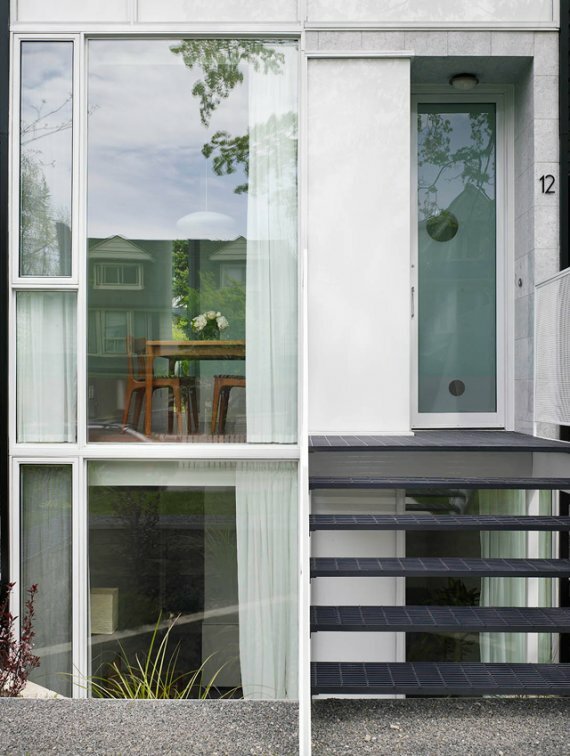 In order to use all three floors as proper living space, a portion of the front yard was excavated to create a two level planted light-well which fills the front room on the lower level with natural light. Visitors to the house have confirmed our belief that many people don’t necessarily want what is currently offered on the real estate market, but don’t know how to get anything else. 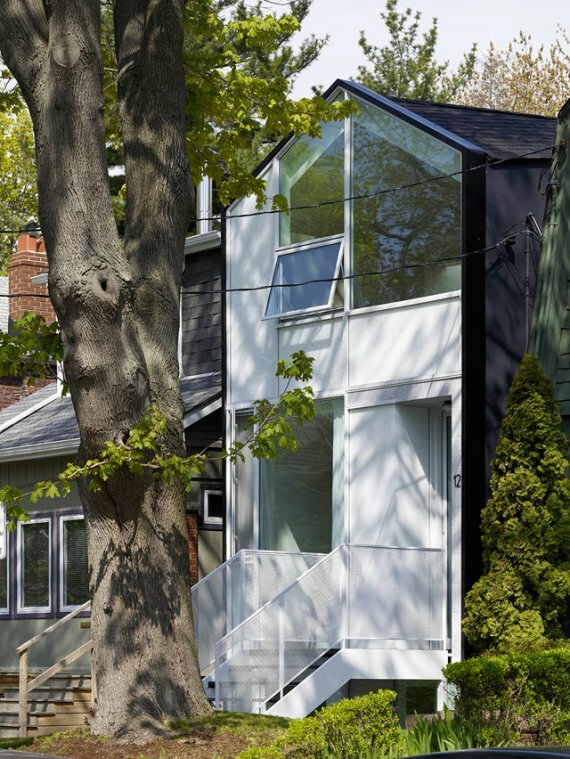 With this house accessible to anybody and everybody (a real estate agent providing the tour) the general public has gained a better sense of what can be done on a modest budget when a creative designer is engaged.